Weight Watchers, DJ Khaled to host pop-up food trucks in U.S. Weight Watchers is partnering with hip-hop artist DJ Khaled to tour the U.S. with a food truck to encourage people to have healthier habits on the go. The experience, called Khaled’s Kitchen Tour, will promote the Weight Watchers Freestyle program and follow the trail that the music artist is taking on his concert tour. The tour will host pop-up events with dishes inspired by DJ Khaled's personal chef, Melissa Zuniga. There will also be a chance to meet the artist and chef at four locations, which will be revealed on social media. 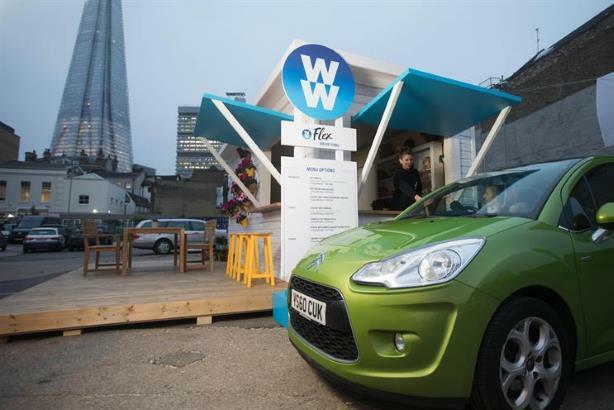 Earlier this year the brand created a pop-up drive-thru in London. "DJ Khaled is helping to inspire communities all over the world to live healthier and be their best selves through his experiences on the WW Freestyle program," said Mindy Grossman, president and chief executive of Weight Watchers International. "Through Khaled's Kitchen, DJ Khaled will have another platform to share his passion for the WW Freestyle program with the world, help guide people toward healthier living in the kitchen as well as showcase how it's possible to maintain a healthier way of life, even when you're on the road."